After Dennis Blair’s assignment as military liaison to the CIA 13 years ago, he groused about all the cloak-and-dagger politics at Langley headquarters. “You’d go to a meeting and think everyone had agreed” to a particular course of action, and then the meeting would end and “someone would come up to me in the hallway and say, ‘Forget what you heard in there’ ” — what we really want to do is something different, Blair once explained. Secret agendas have never been “Denny” Blair’s style. 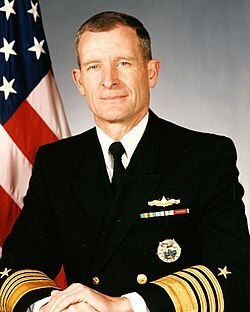 The reserved former four-star admiral, who is widely understood to be President-elect Barack Obama‘s choice as director of national intelligence, is well known in Washington as an intellectual who values straightforwardness and has mastered the byzantine interagency process during his various government stints. In choosing a man so steeped in Washington’s ways, the Obama administration is signaling its intention to streamline the Office of the Director of National Intelligence, which is widely seen as too large, too cumbersome and still too disjointed, according to transition officials. Created by Congress in 2004 over the objections of most leaders of the U.S. intelligence community, the McLean-based ODNI today includes 1,500 employees and a hefty, although undisclosed, number of private contractors. It supervises the nation’s 16 other intelligence agencies, including the CIA. The nomination of retired admiral Dennis Blair as the Director of National Intelligence was predictable, if not quite inspired. In Blair, Barack Obama no doubt saw someone who was, first and foremost, not involved in the Bush intelligence scandals – namely extraordinary renditions, secret prisons, and torture. And while Blair’s brief stint at the CIA during the Clinton Administration didn’t turn him into a seasoned intelligence operative, he’s at least seen the belly of the whale from the inside. The downsides to Blair’s appointment are that there’s little chance he’ll lead the much-needed charge to streamline the intelligence community. As the former commander of the Pacific Fleet, Blair had a vast and sprawling staff that makes the bloated intelligence community seem downright efficient. Then there’s also the fact that, like most military officers, Blair is a believer in tactical intelligence. Let me explain why that’s problematic: During the last Gulf war, the Pentagon badgered the CIA for things like sand samples and stress limits of Iraq bridges, the terrain its Abrams tanks would roll across. Yes, that information was nice to have, but such requests diverted CIA resources from strategic intelligence. Rather than answering the question of whether Saddam had kept his weapons of mass destruction, the CIA sent its clandestine sources into Iraq with baggies and little plastic shovels. On top of it, the two wars in Iraq and Afghanistan have diminished the role of the CIA. It’s the military in those two countries that collects the body of intelligence. Pragmatically, it couldn’t have been otherwise. A lieutenant leading a patrol through an Iraqi village is much more likely to collect relevant information than a CIA officer confined to an office. You are currently browsing the archives for the Langley category.